Margarita Cozzolani was born in November on the 27 in 1602, in Milan. She was one of the most appreciated Italian composers of the 1600s. Margarita was born in a rich and wealthy family of merchants and received, as a tradition, her education within the home, among the subjects given to her there was also Music which seems highly fit to her. So her artistic skills were assigned to the family Rognoni, known and respected masters of instrumental and vocal music of the era. But Margarita will see the opportunity to use her musical skills not so much in a good marital or family indoor rather in the shelter of a cloister, in fact as equally of a custom of the time, preceded by aunts and a sister, Margarita will be a Benedictine in the convent of St. Radegonda, near the Duomo of Milan, in 1620, at the age of eighteen, and will be consecrated with the name, she has chose, of Chiara. In fact, the fame of her skills and ability as a composer earned her the opportunity to publish four works that are not unfortunately entirely all came down to us. 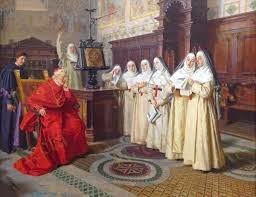 "Visit of the Cardinal", by Salvatore Frangiamore, 1853. Her musical works nevertheless convey between the period of 1640 to 1650 because Sister Chiara was elected Abbess of Santa Radegonda and prefered focused on the commitments and responsibilities of her new charge so or to avoid to her Convent unpleasant situations or to meet the Cardinal Alfonso Litta's wishes who hoped moderation of the use of Music in Churches, her activity was interrupted. Sister Chiara, Maragarita, Cozzolani, died, in the Convent, presumably between 1676 and 1678. 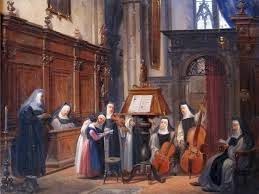 "The nuns of St. Radegonda of Milan, in the possession of the music are equipped of such exquisiteness so rare, that are recognized for the first singers of Italy. [...]. Among that religious ones, deserves the most highest merits Donna Chiara Margarita Cozzolani, named Chiara thanks to virtue; and Margarita, for the nobility of talent, rare, and excellent honor, who if in the year 1620 wore that sacred dress, she succeeded in the exercise of music such a big success that from 1640 up to 1650 has sent to the press, four works of music". Salmi à otto voci concertati con Mottetti et dialoghi a 1. 2. 3.4.e 5. voci all’Illustrissimo Monsignor Badoaro Vescovo di Cremona, Venezia, 1650. PICCINELLI F., “Ateneo dei Letterati Milenesi”, Ed. F. Vigone, 1670. KURTZMAN J., a cura di, “Vesper and Compline Music for Four Principal Voices:Agostino Agazzari, Giovanni Francesco Anerio, Giovanni Battista Biondi da Cesena, Maurizio Cazzati, Antonio Cifra, Chiara Margarita Cozzolani, Bonifazio Graziani, Giovanni Legrenzi, Isabella Leonarda, Tarquinio Merula, Lodovico Viadana”, Ed. Routledge, 2014.